There are so many different ways that one can lose weight. For as many people as there are on this planet, there is an equally interesting and unique way that you can start shedding pounds. The real question is, what is the right way to lose weight for you? For anyone who is trying to lose weight, changes to your diet and exercise routine are absolutely essential. What’s important about those changes and routines, are that they need to be sustainable. The best way to make a diet and exercise program sustainable is to incorporate healthy foods that you enjoy eating, and some type of exercise that you will enjoy doing. No, you don’t have to start running, cycling, or lifting weights in order to lose those stubborn pounds. All you have to do is pick an activity that you may already enjoy and can stick with long term, to keep that weight off. If you are a golf fan, you are just in luck. Golf is a great way to stay active, burn a ton of calories, and enjoy yourself while losing weight and getting into better shape. If you have been playing golf for a while, you probably already have your own set of clubs and golf bag. If you are just getting into golf for the first time, you may not have a set of clubs yet, but if you don’t, no worries. We are going to give you everything that you need to get started. Here are the primary components that you are going to need for losing weight while playing golf. The absolute essential piece of equipment that you need in order to golf. You are going to need a set of assorted clubs for all kinds of situations and distances on the course including irons, wedges, drivers, and putters. If you don’t already have a set of your own clubs and you are not yet sure if you want to invest in a set of clubs yet, no sweat. Most every golf course have full rental sets of clubs that you can borrow for 9 or 18 holes. Clubs are going to be a pain to carry without a bag to carry them in. 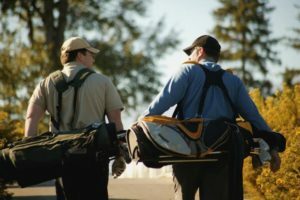 Sure, carrying the clubs around without a bag might be a workout on its own, but let’s play it safe and conventional here and assume that you are going to need a golf bag to haul your clubs. If you are renting from the course, a bag should be included in your rental. You are definitely going to need multiple golf balls and tees if golf is going to be your activity for weight loss. As much as we would like to think that we are going to stay out of the bunker and away from water hazards, that isn’t always the case. Make sure that you have a handful of spare balls in your bag at all times just in case you lose one to nature. Throw a bag of teas in your golf bag for your drives. Most courses have dress codes, and you are probably going to need a good pair of golf shoes or cleats for the course. Need a little extra grip on the club? Get yourself a glove to for wicking the sweat and gripping the shaft. Add a couple of reliable golf rangefinders to your bag. Golf rangefinders show precise distances from your location to the tee. That way, you get an accurate representation of the distances you travel before you walk to the green. A fitness tracker then confirms the distances you see on the golf rangefinders by listing how many miles you walk during your round. Now, the last thing that you need is a course to play one. Find one or two courses in your area that are convenient for you to get to, and that you enjoy playing. Convenience and location will make you more inclined to play more often, which means more calories burned every week. Now that you have all of the equipment, let’s talk about how you can start losing weight by playing golf. The more consistent you can be with exercise and physical activity, the better your results will be and the faster they will come. 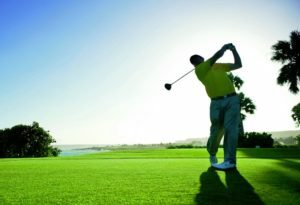 Block out at least 2-3 days per week that you can play 9 or 18 holes. Find some buddies to go with to keep it fun and a little competitive. The reason that golfing is great for weight loss is that you burn so many calories while you are walking around the course. The more that you can walk, the more calories that you will burn, and the more weight that you will lose. Plus, you are going to be burning more calories because of the extra weight that you are lugging around with your clubs. You can burn over a thousand calories in just one 18 hole game, so take advantage of walking. Lose the cart! Staying hydrated on the course is really important for weight loss. Our bodies can commonly confuse thirst for hunger, and if you are thirsty, you will have the tendency to snack more. Staying hydrated is a great way to prevent bad snacking habits. You can’t just say “I want to lose weight” and expect to lose it. You need to set a goal and a date to hit it by. Estimate the number of pounds that you want to lose and pick a reasonable date to lose it by. Keep in mind that a general recommendation for a safe pace of weight loss is 1-2 pounds per week. Use that rule of thumb when setting your goal. Now that you have your strategy, let’s get to it! Block out the days and times of the week that are best for you to golf and start stacking up those miles on the course.